Editor(s): Lee, H.-W.; Kang, Y.; Leung, K.-C. 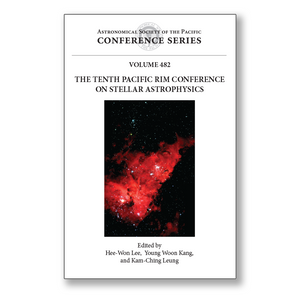 These are the proceedings of the Tenth Pacific Rim Conference on Stellar Astrophysics. The main purpose of this conference series is to accelerate the development of astronomy in many Asian countries and to foster greater interaction between Asian astronomers and those from the Eastern Pacific Rim and European countries in the field of stellar astrophysics. Stellar astrophysics has become more important than ever as a large number of exoplanets have been discovered and observations of exploding stars have led to the precision measurement of the accelerating expansion of the universe. We are now witnessing a revolutionary change in our view of the cosmic history of the universe and addressing philosophical questions about our existence. Astronomers from all over the world are working on increasingly diverse topics in stellar astrophysics. Readers of this volume will find recent developments in a wide range of observational and theoretical studies of high-energy and compact sources, dynamical and evolutionary explorations of normal stars, and measurements with interferometers, photometers, spectrographs, radio telescopes, and satellites.